A Net Zero home is nearing completion, and it is exciting to watch all the details come to fruition. From setting the foundation, and now to the beautiful blue paint color, things are moving along. There’s still a chance to choose some of the finishes going inside, and we have plans to finish this gorgeous home by late summer. It’s called Net Zero, because the home is so energy efficient, with the addition of solar panels, it has the capacity to generate the same amount of energy that the homeowners use. 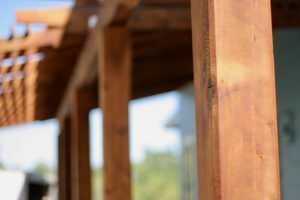 Close-up of gorgeous front porch beams. It’s been amazing to see Better Builders of Oregon using their expertise in ICF (Insulated Concrete Forms) to build the Net Zero home and make it even more energy efficient. Building with ICF means it’s not only an extremely tight envelope that saves you on energy bills, it’s also made out of 100% recycled materials. Now, that’s sustainable living. This home is over 2,100 square feet with four bedrooms and 2.5 baths. 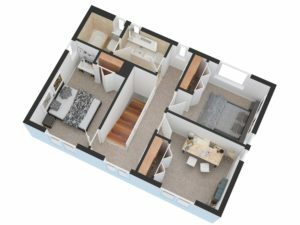 The master bedroom is on the main floor, and it’s open plan style is perfect for easy access to it’s private courtyard. Rendering of level one of Net Zero home. Picture waking up in the morning, fixing a cup of coffee (or tea) and just sliding the door open to the sunshine. The outdoor living area is a great extension of your home, and this outdoor living extends all the way out into our community. All the way to the shared green space of our agrihood with the urban farm, cedar groves, and a babbling creek that cools the breeze and flourishes with wildlife in our sustainable community. Want to just pluck a blackberry off the vine (or a blueberry) and pop it in your mouth? No problem, because we only use, organic, healthy and sustainable land management practices. 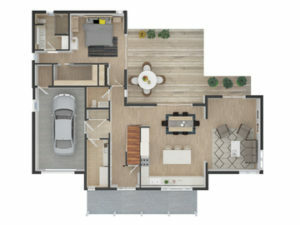 Rendering of level two of Net Zero home. If you’re curious about taking a tour to the almost finished Net Zero home, please contact us. We’d be glad to show you this innovative wonder amidst our urban oasis. 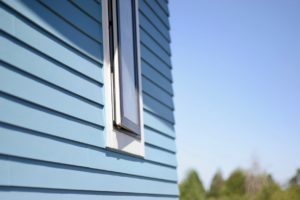 Sky blue Net Zero siding.